What is the one thing that for decades upon decades has helped turn seemingly normal and stock-standard cars into machines that look like they belong on a race track? No, it’s not the spoiler, as that can have the opposite effect at times! I am, of course, talking about the fender flare or the over-fender. In its crudest form it may only be a simple strip of moulded plastic or metal, but once bolted in place it has the automatic effect of adding girth and therefore aggression to pretty much any car. 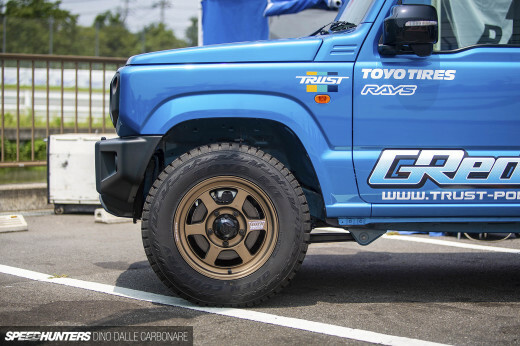 Back in the early days of Japanese motorsport, it was the most efficient and cheapest way to make space for wider wheels and tyres, giving engineers the scope to use a wider track and therefore maximise grip and handling characteristics. Fast forward to 2015 and the simple flare has evolved and been adopted by those who want to transform the look of their street cars. 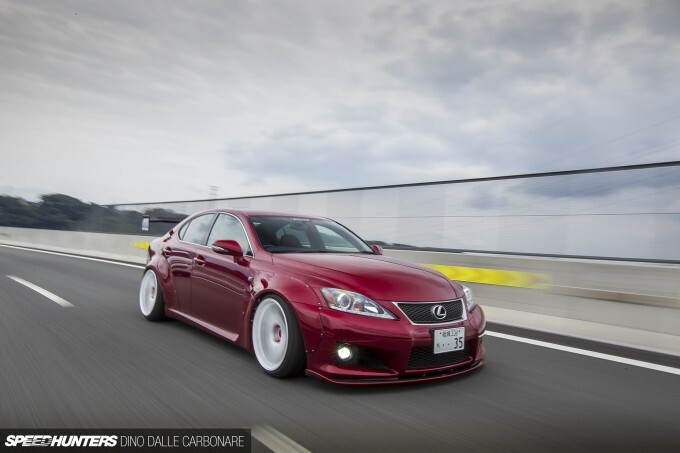 When wanting to do something a little more daring with his new Lexus IS F demo car, Takemi-san at Lexon decided to call in the help of Kei Miura. Mr. Over-fender himself came up with a bespoke treatment for the most powerful version of the previous generation IS, one that would add that signature look we have seen applied to so many cars, yet still embody the luxurious look and feel that Lexon has become known for. The design transforms a somewhat subtly-styled sedan into something that is guaranteed to attract attention wherever it may go. Now that Lexus has reinvented its design language and released far more daring styling on both the new-generation IS and the recently released RC F, the Lexon kit definitely affords IS F owners the opportunity to not be left behind. The Miura touch was a little more complex to achieve on the IS F, especially up front where the fender merges into a long oblique vent. That was incorporated into the widening and it was all fixed in place with exposed stainless steel screws. The car sits on Air Runner air suspension, so once it’s parked up Takemi can drop it right on the ground at the touch of a button. The compressors and tank are all hidden away in the trunk so as not to take up too much room. 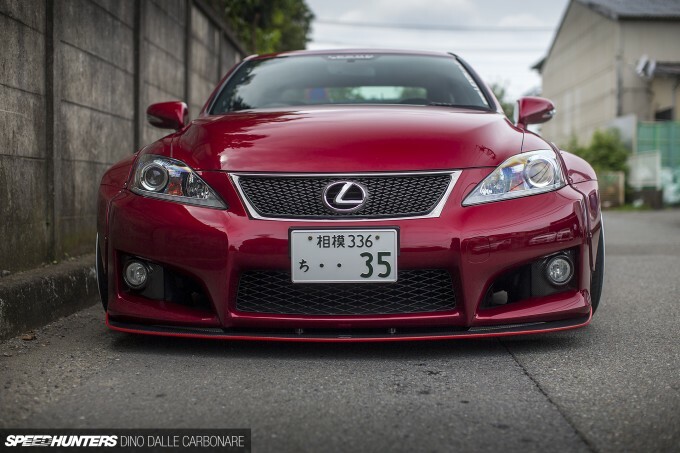 The over-fender kit is then mated to an assortment of Lexon Exclusive dress-up parts available for the IS F, including the carbon fiber front lip spoiler and LED fog light inserts. It all combines to give a menacing stance to the car, no matter which angle you are looking at it from. However, the detail that really makes the car stand out is the choice of wheels. 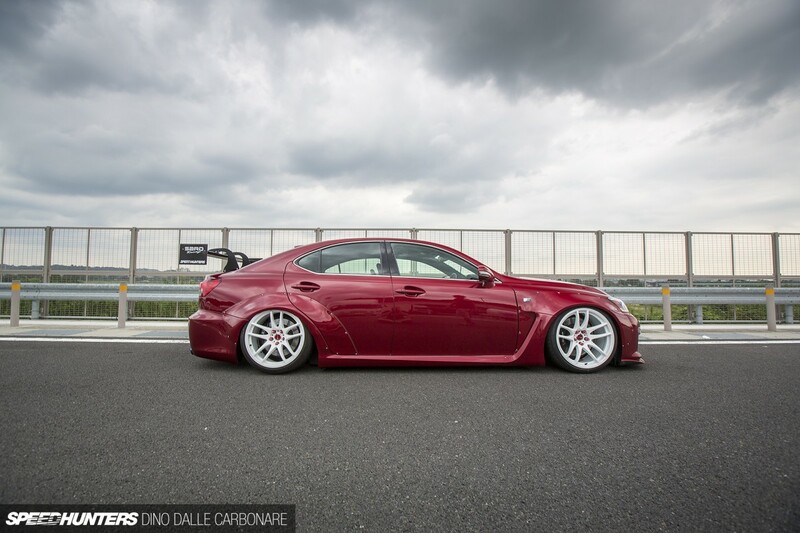 Being a car more geared toward luxury than track performance, most of the IS Fs you see modified in Japan are usually sitting on big polished rims, going for the more show car and VIP look than anything else. So the decision to go with a set of white Work Emotion Kiwamis is one that truly get the sports feel across. The 19-inch Works measure a massive 10.5-inch across on the front and 11-inch at the rear with just the right offset needed to allow them to just tuck inside the over-fenders when the ‘low’ button is pressed on the air suspension controller. I quite like the almost-color-matched Lexon wheels nuts too. If there is one thing Lexon knows how to do, it’s stance. It doesn’t matter if your car is on air or sits statically low, Takemi will know how to make it look just right and avoid any nasty rubbing. The rear over-fenders are a massive affair, comprised of three pieces that beef up the rear guards all the way from the doors right over onto the rear bumper. 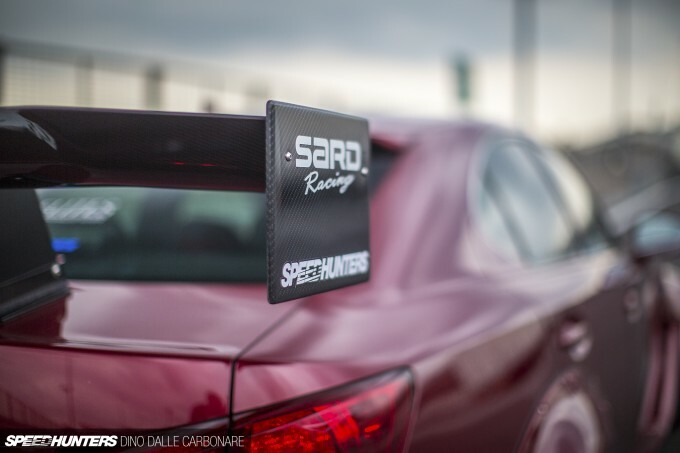 It’s then all completed with a carbon fiber rear wing from Sard. 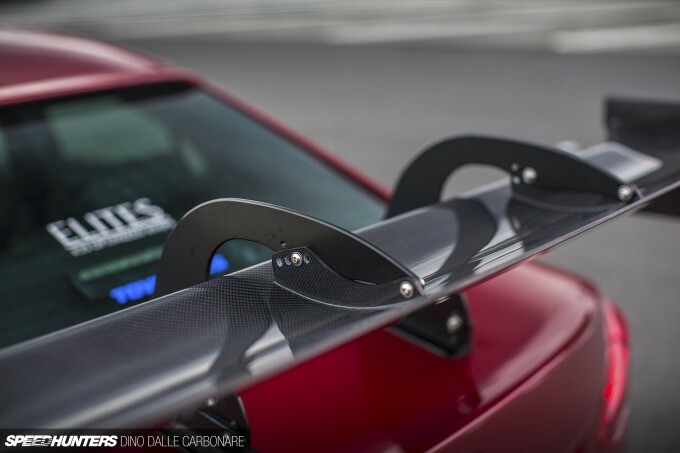 And of course, as the current trend dictates, it’s mounted on swan-neck stays for that DTM and Super GT feel. 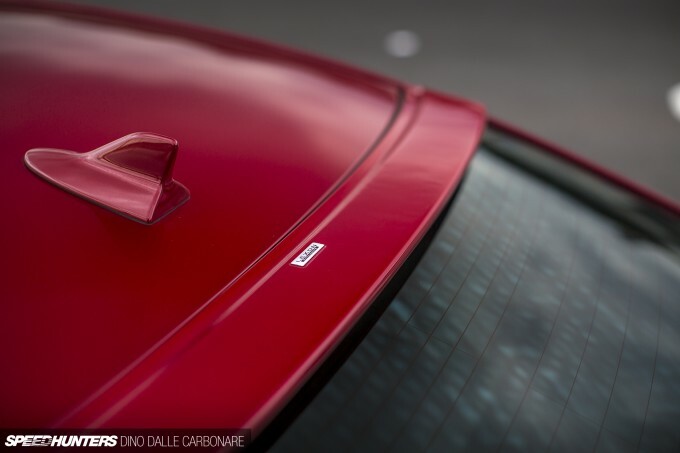 Lexon’s small roof spoiler, a popular item that is offered for every single Lexus model out there, adds a touch of continuity to the roof line. 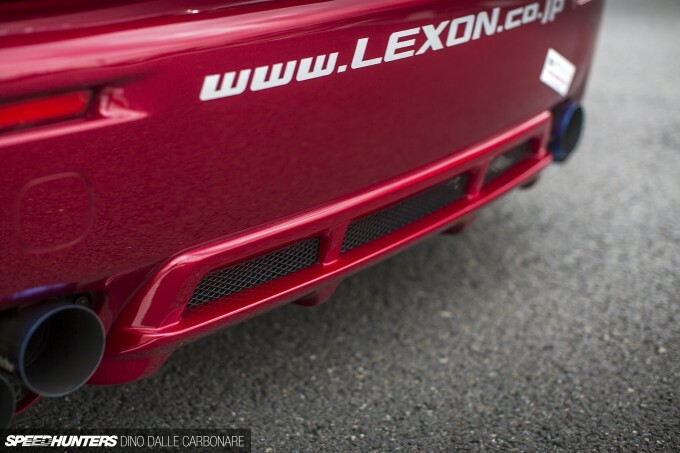 Completing the aero additions is the Lexon Exclusive rear diffuser, which fits onto the lower center section of the stock bumper. 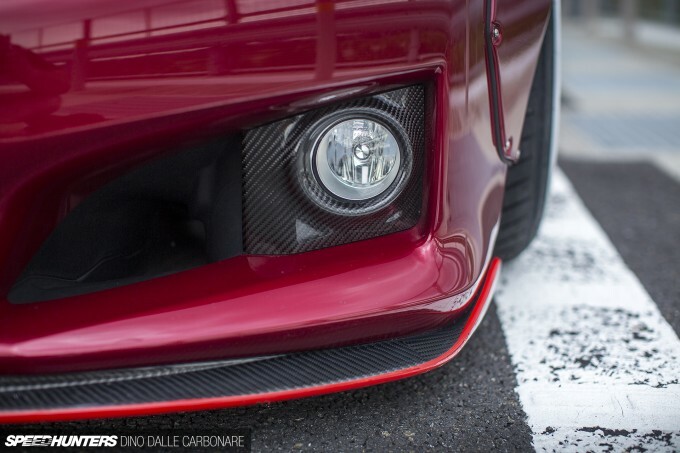 Having a big naturally aspirated engine pushing out 420PS, Takemi was never really too concerned that the car wouldn’t have enough performance to back up its in-your-face looks. But just to be sure, he had a little go at tuning up the 5.0L V8. 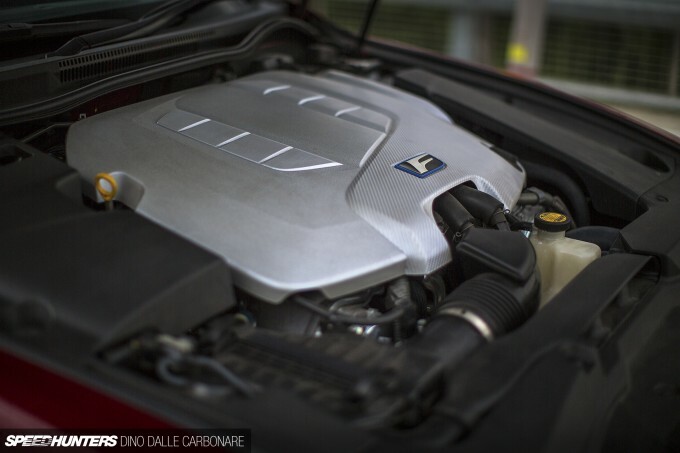 The Lexon ECU reflash helps liberate a few extra horses, bringing up power to the 450PS mark. However, most of this gain comes courtesy of the quad-tipped exhaust. The GReddy system frees up just the right amount of back pressure, without upsetting the finely-tuned intake and exhaust balance that highly-engineered motors like this Yamaha-designed V8 rely on to achieve their performance characteristics. Hit play on the video above and have a listen at the low-frequency burble that these pipes generate. They’re a balanced addition, slightly louder and a little more menacing in look than the stock exhaust, but in no way over the top. 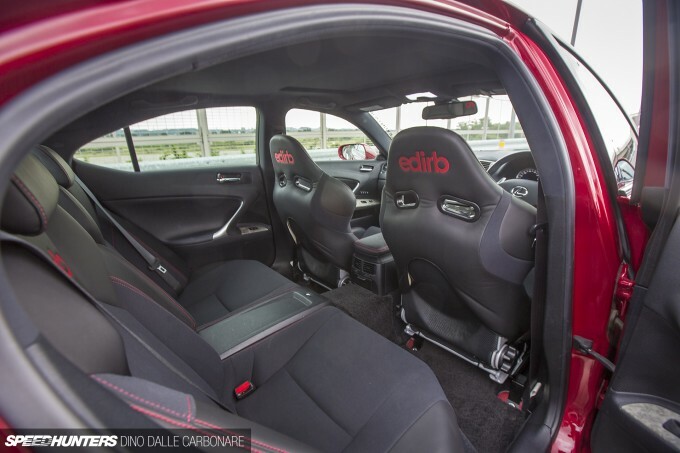 A great match to the new visual attitude of this IS F.
The Air Runner TC5 Club Circuit Spec suspension allows the car to corner with more precision and less roll, meaning there was a need for slightly more supportive seats in the cabin to keep occupants from sliding around too much. 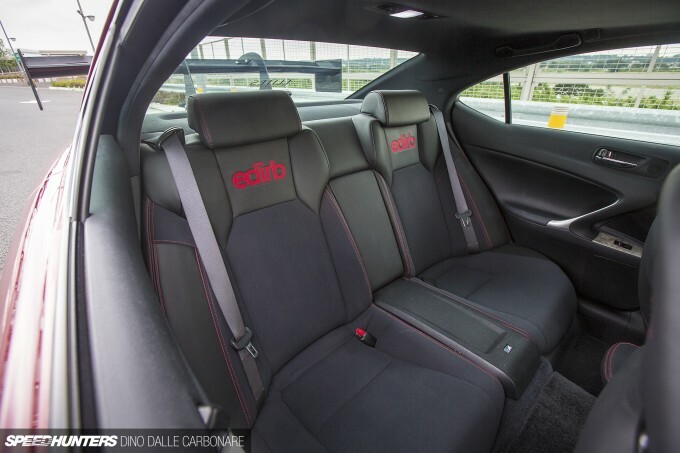 The more luxurious lineup of Edirb seats from Bride is a match made in heaven – sport seats finished off in smooth leather around the bolsters and a grippy, suede-like fabric for the insides of seat and backrest. 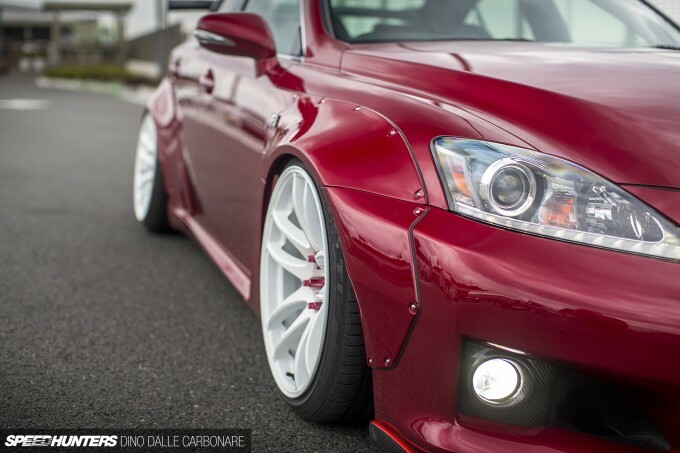 Being a Lexus, trim levels were already very high to start off with, so no real upgrades or changes were needed. Thankfully, the Lexon demo car was based on an IS F not fitted with silver carbon-like trim on the center console, something I personally never liked. However, Takemi wasn’t quite content at having just the front seats changed out. He wanted to have a sense of continuity carried over to the rear as well, so after a quick call to Bride, he dropped the car off with them for a couple of days so a few custom one-off touches could be made. 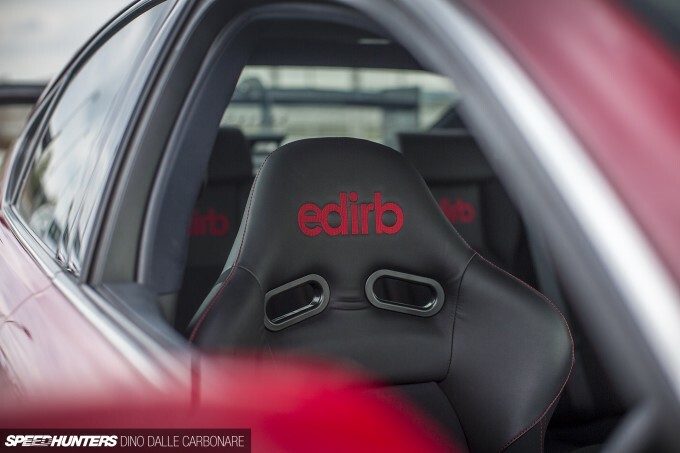 The same leather and fabric was used as upholstery and the Edirb logo was stitched onto the two backrests. There is nothing quite like having matching front and rear aftermarket seats. 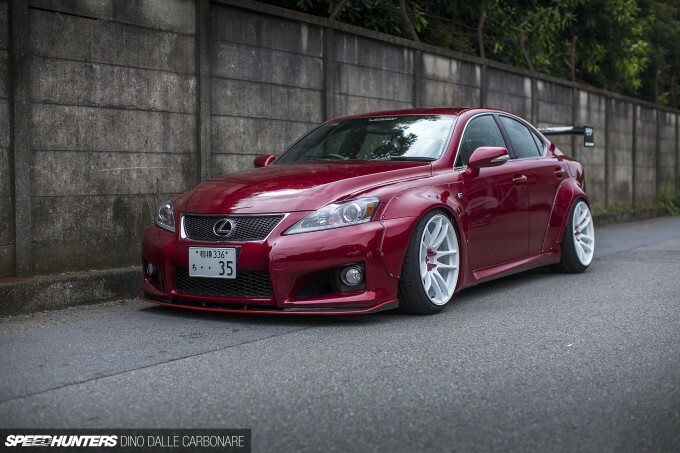 Doing a wide-body conversion to a Lexus IS F isn’t something everyone is going to do. But the affordability of these cars is going to make them far more popular in coming years, and for those that just can’t digest the conservative styling, well, they will know who to contact! Could This Be The Perfect SR20 Setup? I am certainly in the camp that has a decently difficult time understanding why overfenders offend some people to such extent. Granted, I haven't been exposed to a number of butchered examples, so I haven't been soured early on. But I guess when you change something, the beauty is very subjective to change as well. I hope that artists like Miura-San, Nakai-San, and numerous shops continue to keep up their work for years to come. 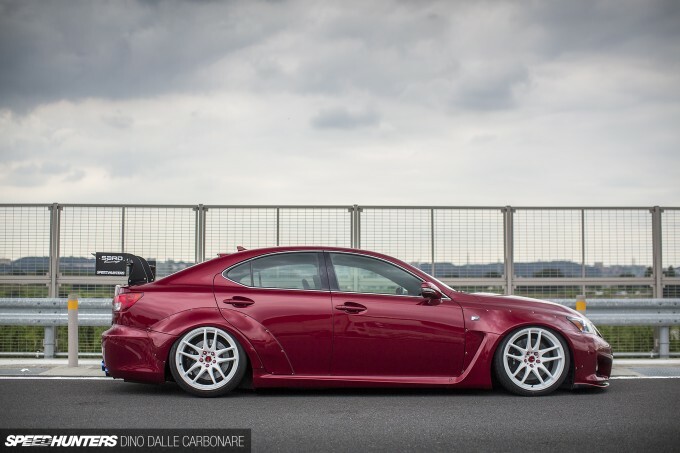 Now, more on topic, I can't say I'm a fan of Lexus - or of many luxury vehicles marques to begin with - but this one really does something for me. The obvious might be the 'track day' touches that have been added, but it feels a little beyond that. The lines from the front especially seem finalized. Plus I am a huge sucker for the swan neck configuration. And that burble! Really glad you guys have been taking some time to prepare some videos for the audiophiles. Sexiest exhaust I've seen in a while, and what a sound! I don't think anyone would make the mistake of thinking this belongs at a race track. Plenty of people wear track suits but you know they're not athletes. I think that this is an awesome looking car. I've always liked the was the is250 looked and its cool to see someone is making parts for it that look really nice and the sound of the exhaust is amazing. Looks like any other bagged out car I've seen lately. xrockonx It was designed by Kei Miura for Lexon. There are about 30 body parts manufacturers that get their stuff designed by Miura. rook56 Who said it did? ""The way I see it, all cars don't look their best out of the factory."" Totally agree, most cars don't look best stock. speedhunters_dino kphillips9936 Between here and on the streets, this is nothing new. Some pull the fenders while others do overfenders. The wing just doesn't sit right with me and of course can't be complete w/o the cambering air bags. But hey to each their own, just not my cup of coffee. Those seats are gorgeous...me wants! Now that is a sentiment I fully I agree on! A crisp canvas awaiting the painter's brush. I just wish the exposed rivet trend would die. No need for them on a luxury car. Makes it look cheap. It would look soooo much better molded in. On a side note I am kind of on the fence about bride spelling their name backwards. 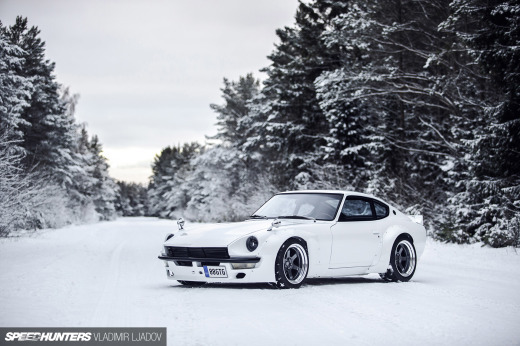 speedhunters_dino xrockonx "If I had a cnc machine to help me make body kits like Kei Miura I would be sooooo happy." [fender flare] " turn seemingly normal and stock-standard cars into machines that look like they belong on a race track". You did! And I strongly disagree. Great read Dino, always wanted to know more about this car. Came up with new inspirations after this, thanks! @speedhunters_dino great post. I've always loved the aggressive styling of the IS-F. Also you guys should do more walk around videos like you did in this post! I can't imagine it taking more than busting out your phone and recording a quick vid lol either way keep up the good work!